To those serving our country - I THANK YOU. Well said and a wonderful tribute! 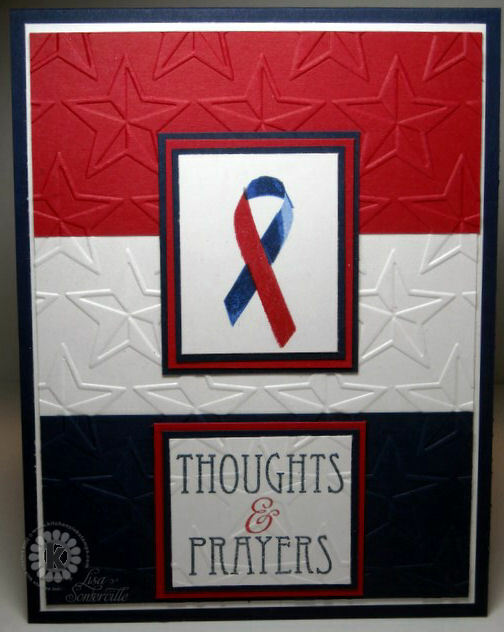 Excellent card in memory of the fallen innocent. This is a wonderful card, Lisa...such a fitting tribute too! Love the embossed stars in the background! Hugs! Fantastic! Striking design...and wonderful sentiment. Wonderfully designed card and such an honorable tribute. Well done, Lisa! Thank you for making that, Lisa. Love the embossed star background in red, white, and blue for this gorgeous ribbon!! What an awesome tribute to mark this sad anniversary. Great tribute Lisa! Hope you have a wonderful day!!! Love it, and it shows your truly hold the meaning in your heart. Awesome tribute to a sad day! Beautifully done! Wonderful reminder and love how you did the background with the multiple embossed papers. Beautiful and stunning card, Lisa!